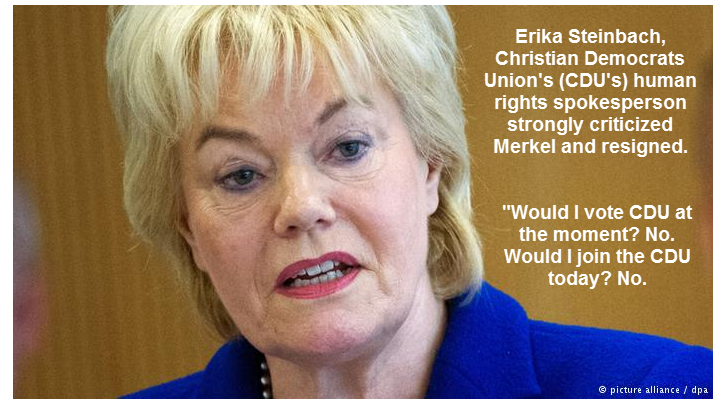 Merkel’s human rights speaker, Erika Steinbach, resigned over the chancellor’s immigration policy. She also left the CDU party. Erika Steinbach, who’s been with Chancellor Merkel’s CDU for 43 years, has strongly criticized the leader’s handling of the migrant crisis. She claims conservatives have been sidelined in Germany’s main ruling party. “Would I vote CDU at the moment? No. Would I join the CDU today? No. I can only draw the honest conclusion of leaving the CDU,” she told “Welt Am Sonntag” (WaS) newspaper. It’s quite obvious Merkel wanted mass immigration. It’s debatable why, but German citizens have to put up with the consequences whatever Merkel’s reason. If there was a strong candidate willing to challenge Merkel from within, Merkel would easily lose her next election. It’s possible Merkel loses anyway. Regardless, her “Grand Coalition” has completely splintered as members of her own party are fed up. Even if Merkel wins, I doubt she lasts the full term. This article was posted in "Angela Merkel ", CDU party, Christian Democratic Union of Germany, Erika Steinbach, Federal Office for Migration, German Lutherans, Germany, Grand Coalition, Newspaper, Politics, Politics of Germany, social issues, US Federal Reserve and tagged government. Bookmark the permalink. Follow comments with the RSS feed for this post. Both comments and trackbacks are closed.